“Glass will become the tool of choice to connect patients, physicians, and the electronic information that we have to deal with. Absolutely,” said Dr. Rafael Grossman, of Eastern Maine Medical Center. BANGOR, Maine — One morning in June, several students at Eastern Maine Medical Center huddled around an iPad, watching a live video of a surgical procedure. In a nearby operating room, trauma surgeon Rafael Grossman was on the business end of the video feed. The camera man? Grossman himself. The surgeon recorded the procedure using Google Glass, the wearable computer and video camera mounted on a pair of lightweight eyeglass frames. Many medical professionals, including Grossman, say they believe it will have far-reaching implications for the health care industry. Grossman streamed video of the surgery to demonstrate Glass’s potential as a teaching tool, for example, or to help other doctors at rural locations in Maine get through unfamiliar procedures. “To bring someone to see exactly what you are seeing, the same line of vision, I think that is very powerful,” Grossman said. Google Glass is not yet available to the public, but Google has distributed a number of the devices to software developers and tech enthusiasts in various fields, many of whom are writing new applications or testing Glass in various scenarios. Grossman got one of 8,000 released in June through a social-media contest, for $1,500. The sleek frame sports a small glass cube above the right eye that is the computer’s screen, or monitor. Next to it is the video camera. The right-temple piece acts as a slender trackpad, sensitive to taps or swipes, the way a mouse or pointer works on a standard computer. The hands-free function can allow a doctor, for example, to continue performing surgery while calling up relevant medical information that will be displayed on the screen. The health care industry has been eagerly awaiting Glass. 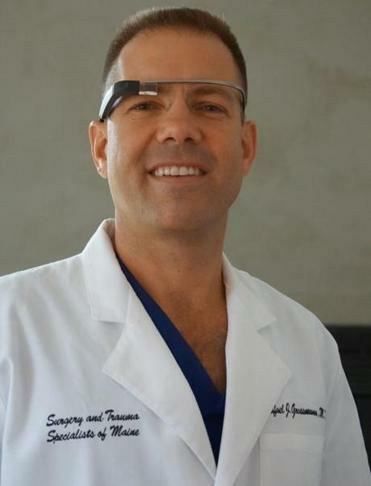 Grossman said Glass will advance telemedicine, in particular — the delivery of health care information and even treatments to and from remote locations, using technology. Eastern Maine Medical Center provides high-level care for 15 other hospitals in the state covering a rural region nearly the size of Massachusetts, New Hampshire, and most of Vermont combined. Just a few years ago, Maine telemedicine was based on fixed, desktop computer stations. Those stations were soon replaced by smaller computers on carts. Now, Grossman often uses a smartphone to connect with physicians at rural hospitals who need help. As an example, he cited a burn patient. “They describe the patient and can even show me the burn,” Grossman said, describing a likely scenario. “And I can say that burn is really critical and it needs to go directly to Boston. Or I can say it just needs local treatment. Or bring the patient here. “Why would I want to have my phone in my hand in telemedicine when I could just have this screen here?” he said, gesturing to the monitor above his right eye. In another test case, Grossman used Glass to remotely coach a Life Flight air ambulance crew that was training with a high-tech mannequin while viewing his instructions on an iPad. At one point, the scenario involved the “patient” developing an irregular heartbeat, so Grossman linked up with another Google Glass tester, a cardiologist in Houston named Christian Assad, who participated in the training. With two Google Glasses and an iPad, Grossman and Assad were able to walk the Life Flight crew through the correct response, said John Stuart, an Eastern Maine Medical physician’s assistant who participated. Stuart said he thinks the technology will be especially valuable for training. But it may be some time before Glass is standard equipment, even in operating rooms, partly because of concerns about privacy and compliance with the federal Health Insurance Portability and Accountability Act. For now, smartphones remain the preferred device at the hospital, Grossman said, but maybe not for much longer.